The Little Tikes 4-in-1 Trike Deluxe Edition is a tricycle that grows with your child! First, the parent pushes and steers. As the child grows, the parent steers while the child pedals. When they learn to pedal remove the waist bar and now they can steer. Last stage the child pedals and steers with the parent bar removed! Read the full review of the Little Tikes 4-in-1 Trike Deluxe Edition here. 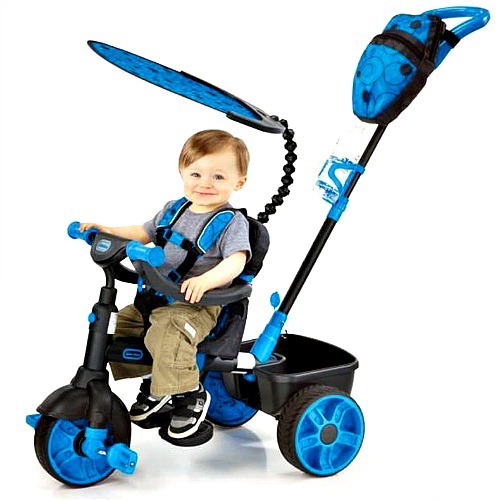 One winner will receive the Little Tikes 4-in-1 Trike Deluxe Edition Bike (valued at $110.00). To enter, submit your info using the entry form below. One winner will be randomly chosen from all eligible entries. Giveaway ends October 30, 2014. US residents ages 18+ only. Disclosure: Mom Blog Society received an item for review only and no other compensation for the giveaway. No other bloggers involved in the promotion of this giveaway were compensated in any way for the promotion of this giveaway. The bloggers involved in this giveaway are not responsible for prize shipment or fulfillment. Prize delivery and fulfillment is the responsibility of the sponsor (Zipz). The winner will be notified via email and has 48 hours to respond or another winner will be selected. Facebook, Pinterest, and Twitter are not endorsing or liable for this giveaway. We have been wanting one of these for our 18 month old. Would be the perfect christmas gift. With the way that it can transition I’m hoping that all the kids can enjoy the bike and soon there will be 3 of them ages 4 and under! A co-worker is pregnant with a boy and I’d give this to her. I would love this for my little man!